I don’t just mean that the individual things in Star Wars are old – the “used future” aesthetic – or even that cumulative effect of all of those old things produces a time abyss. I mean that Star Wars does not feel like the future, it really does feel like something that happened in the distant past (I’m speaking of the original trilogy here). It feels not just old, but ancient. It is very hard for me to separate my thinking on this from the influence of paleontology, and specifically from having been crazy about dinosaurs and other prehistoric animals from about the age of 3 onward. I grew up with the bone-deep knowledge that monsters signified the past, whether it was the mythical monsters on the terra incognita at the edge of Renaissance maps, or the real monsters of Earth’s deep history. 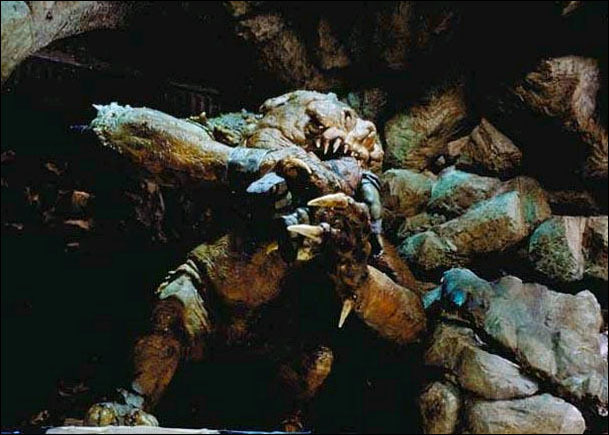 Star Wars not only had biological monsters (dianoga, wampa, space slug, Rancor, Sarlacc…), but also monstrous machines that seemed like they had been resurrected from some kind of mechanical prehistory. AT-ATs are basically dinosaur tanks. Jawa sandcrawlers and Jabba’s sail barge are not far behind. 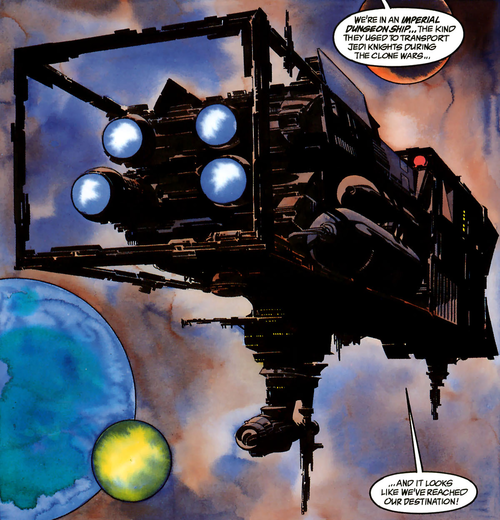 So I think the visible old-ness of the things on screen works on two levels: the aging and weathering – the blast marks on the war machines, the rust on the desert vehicles, the obvious patchwork repairs on the Millennium Falcon and the Rebel Y-Wings – establish that these things are old within the context of the story. But the very alienness of their design works on another level. 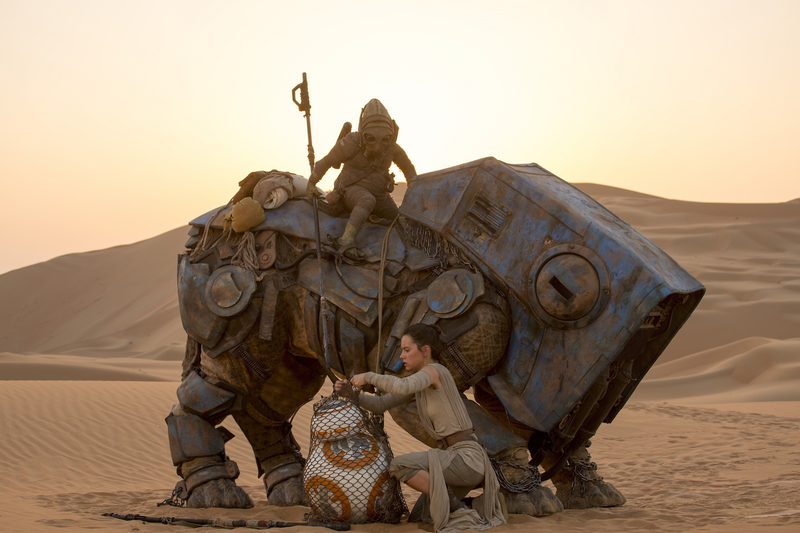 The best vehicles in Star Wars do not seem like products of our late-20th and early-21st century design culture. 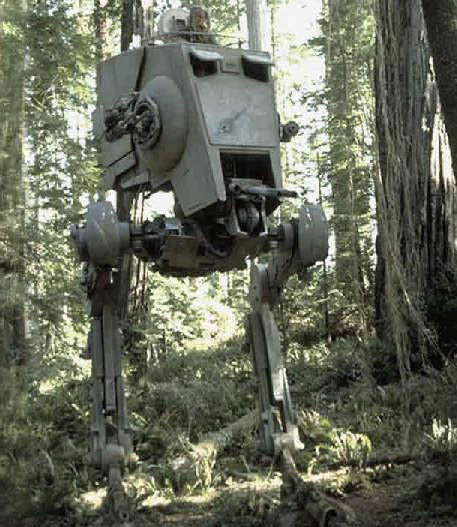 No civilization that depends on things like Chevrolets, iMacs, and F-15 Eagles is going to produce AT-STs. They come awkwardly tottering in from somewhere – and, crucially, somewhen – else. So these physical objects don’t just seem used to the characters within the story, they also seem ancient to us, the audience. It’s worth pondering why the not-of-our-time-ness of Star Wars points so convincingly to the past instead of to the future. I think there are a lot of elements that conspire to make that happen, from the opening lines of the movie (reproduced in the title of this post), to the used-future aesthetic playing a perceptual trick on us – if things in-universe seem old to the characters on screen, and we identify with those characters, then those things can’t help but seem old to us as well – to things like the ubiquitous monsters, which you don’t have to be a paleontologist or dino-nut to know are cultural signifiers of the past. Finally, the mythopoeic grounding of the story itself points back to a bygone age of knights and princesses, not a (comparatively) sterile future of space station engineers and hydroponics techs. Whenever I watch Star Trek, I clearly get the impression that it takes place in the distant future. However, when I watch Star Wars, for some odd reason that makes no sense, I almost get the feeling that it takes place in a VERY distant past. I think this has implications for why some things feel more like Star Wars to me but other’s don’t. It’s probably part of the reason for my dissatisfaction with the prequels – all of that shiny history-less futurism feels a bit weightless compared to the gritty realism of the original trilogy (the death-by-bluescreen and clumsy execution certainly don’t help). Turning to the (now abandoned) Expanded Universe, I think it’s part of why Dark Empire works for me more than the Thrawn Trilogy (which I still very much enjoyed). DE is full of weird stuff – like Imperial dungeon ships, hunter-killer probe droids, and viper automadons – that capture the same alienness-of-the-past vibe I get from the original trilogy. In contrast, Timothy Zahn introduced very few new elements in his books. He mainly plays with established ideas and technology, and even though he sometimes combines them in stunning ways (e.g., Nomad City), it gives his books a more limited feel than the full-throttle weirdness of the old movies. This entry was posted in sequels, Star Wars. Bookmark the permalink.